Illustrates the site of North America's first Gold Rush. A New Map of Nth. Carolina with its Canals, Roads and Distances from place to place, along the Stage and Steam Boat Routes. 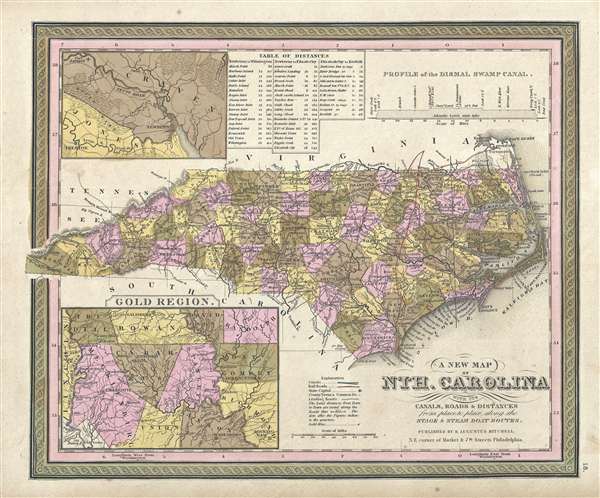 This is an important 1849 map of North Carolina by Samuel Augustus Mitchell. This map shows cities, topographical features, railways, ferries and roads with color coding at the county level. In addition to cartographic information this map is full of practical data for the armchair traveler including a profile of the Dismal Swamp Canal (an important trade artery in the region), a Table of Distances, and insets covering the vicinity of New Berne and the Carolina Gold Region. Of particular interest is Mitchell's focus on the North Carolina gold region highlighted by an inset in the lower left quadrant. Gold was first discovered in Cabarrus County North Carolina in 1799 by twelve-year-old Conrad Reed. Reed discovered a seventeen-pound gold nugget setting off the first Gold Rush in the United States. Additional gold deposits were soon discovered in neighboring Montgomery, Stanly, Mecklenburg, Rowan and Union counties – many of which are labeled here with stars. The Carolina Gold Rush was a major factor in the settlement and population of the western parts of North Carolina. Cartographically this map is based on the earlier work of Tanner though it has been updated with new information as well as Mitchell's distinctive decorative border and color scheme. This map was published in various forms and editions from 1846 to the late 1850s, when the series was completely redesigned Charles DeSilver. This map was issued in the 1849 edition of the New Universal Atlas, the last edition of that atlas to be published by Mitchell his late 1850 sale of the plates and rights to Thomas Cowperthwait.